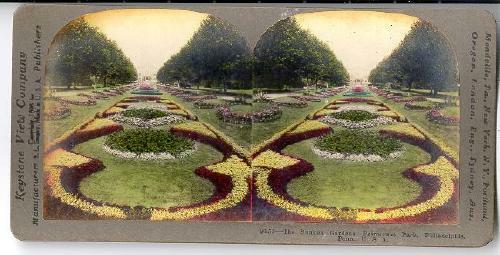 9353 -- The Sunken Gardens, Fairmount Park, Philadelphia, U.S.A. Historical information about the park on verso. Keystone View Company. (c)1898 by BL Singley. with rounded corners. Dark Gray verso. at edges of photos. Moisture stain on back.